Nothing beats the classic roasted whole turkey on Thanksgiving. 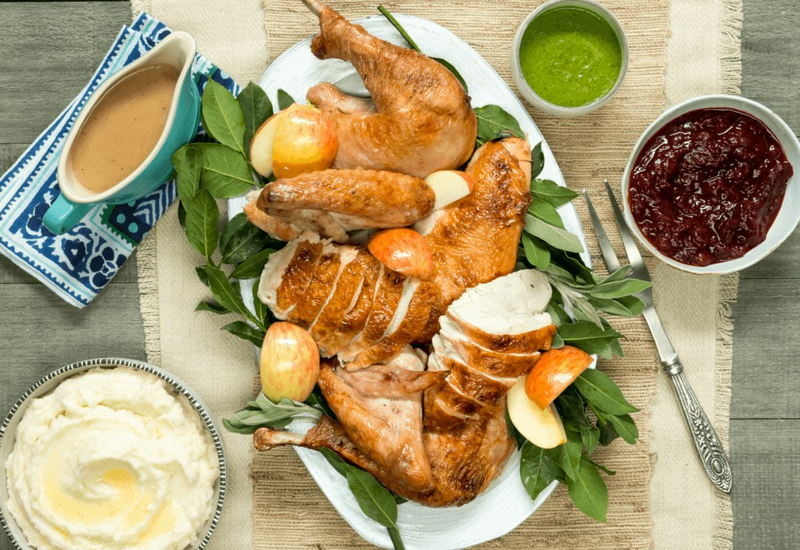 Our version here uses aromatics and a glaze to bring the flavor to the table, supported by a homemade gravy and a simple blended herb sauce for a main dish that will please both the palate and the eye. Use turkey stock in place of the chicken stock in making the gravy if available to you. Per Serving: 553 calories; 38g fat; 26.5g carbohydrates; 26g protein; 135mg cholesterol; 3083mg sodium. I didn't expect the green sauce to work but it really does! That said, I'm still a gravy fan. Putting chicken stock in the roasting pan ensures that the turkey stays moist! Yummy! This is my new go-to recipe for roasted turkey on Thanksgiving! You don't have to worry about under or over cooking. All of the measurements are perfect, and the flavor is impeccable. Very good turkey recipe, super impressed with the results! The meat was tender and flavorful. This is now our tried and true "family recipe" for the holidays we can pass down. This recipe was so easy to follow! Such a great idea to reserve the turkey drippings to make gravy. Smart! This turkey turned out perfect and it was simple to make, even for a first timer like myself. Perfect Thanksgiving dinner recipe! Really impressed with the herb sauce, turned out nicely. Delicious, moist, and juicy turkey! The herb flavors were really nice. Can't go wrong with rosemary, thyme, garlic, etc. Solid recipe!